With 375 partners and guests in attendance at its facilities at Montréal–Trudeau airport, Transat A.T. Inc., Canada's largest integrated tourism company, on Monday celebrated its 30th anniversary, taking the opportunity to unveil its new fleet livery, which, like the company, blends innovation with continuity. Throughout its 30-year history, Transat has stayed true to the vision of its founders: that of a leisure travel company open to the world. Today, Transat offers customers 60 destinations in two major markets: transatlantic (Europe and the Middle East) and South, out of 21 Canadian airports. It commercializes its flights to Canada in 13 European countries, as well as in Israel, the United States and at its Sun destinations. It boasts 5,000 passionate employees worldwide, who help brighten the everyday with the joy of vacations for more 4.5 million passengers every year. And it is working to build a better future for the planet, through engagement with communities and investments in sustainable development. 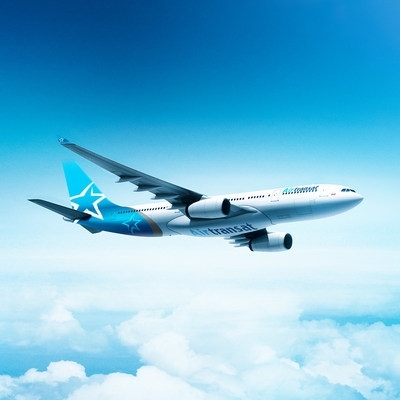 Unveiled during the evening, the new Air Transat fleet livery reflects the recent evolution of the Transat brand image and remains faithful to the company’s promise: to brighten the everyday with the joy of vacations. The star symbol, recognized emblem of Transat, is proudly displayed on the tail and the rear side fuselage and also on the wingtips. To mark the 30th anniversary, the design uses touches of grey, a nod to Air Transat’s very first livery. That livery features gradated shades of blue, to evoke the transformative power of holidays. Finally, the Air Transat name appears on the side and underside of the fuselage, ensuring its visibility even when the aircraft is in flight.